LA JOLLA—Agricultural grafting dates back nearly 3,000 years. By trial and error, people from ancient China to ancient Greece realized that joining a cut branch from one plant onto the stalk of another could improve the quality of crops. Now, researchers at the Salk Institute and Cambridge University have used this ancient practice, combined with modern genetic research, to show that grafted plants can share epigenetic traits, according to a new paper published the week of January 18, 2016 in the Proceedings of the National Academy of Sciences. That genetic information shared between plants isn’t DNA—the two grafted plants keep their original genomes—but epigenetic information is being communicated within the plant. 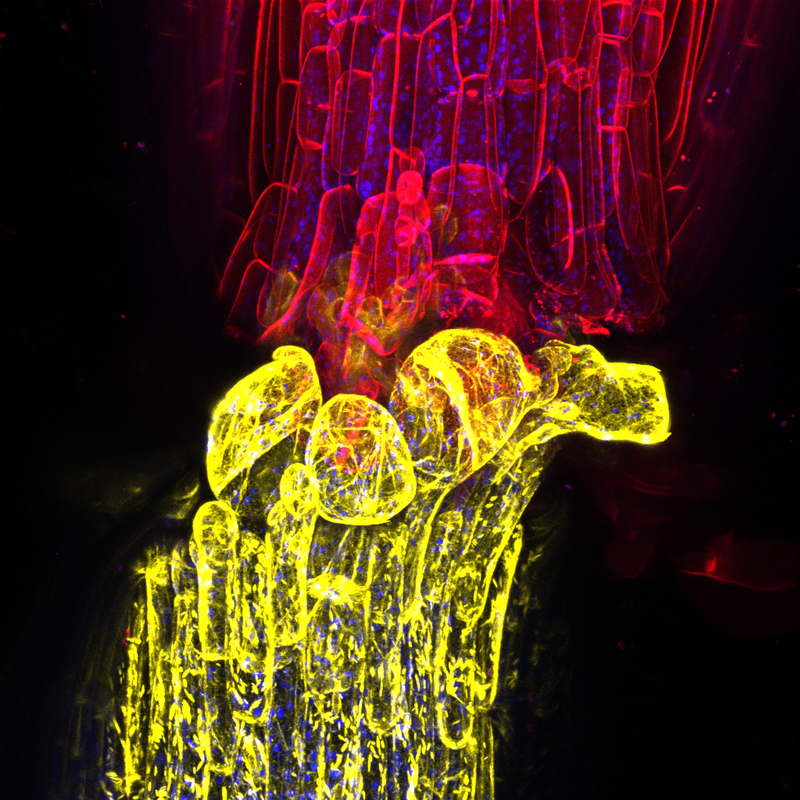 A graft between two genotypes of Arabidopsis thaliana, shown in a confocal microscopy image. One genotype has plasma membranes marked in yellow, and the other marked in red. 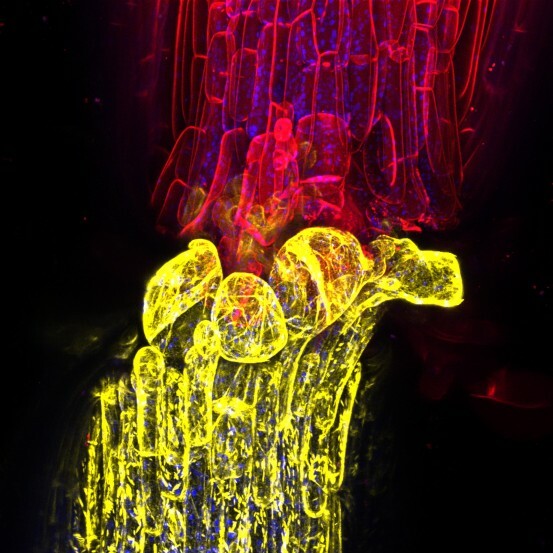 Researchers studied the movement of sRNAs across the graft junction, and the resulting epigenetic changes in the plants’ genome. In epigenetics, chemical markers act on existing genes in a plant or animal’s DNA to turn genes on or off. Epigenetics can determine whether a cell becomes muscle cell or a skin cell and determine how a plant reacts to different soils, climates and disease. “In the future, this research might allow growers to exploit epigenetic information to improve crops and yields,” says Mathew Lewsey, one of the first authors of the paper and a Salk research associate. 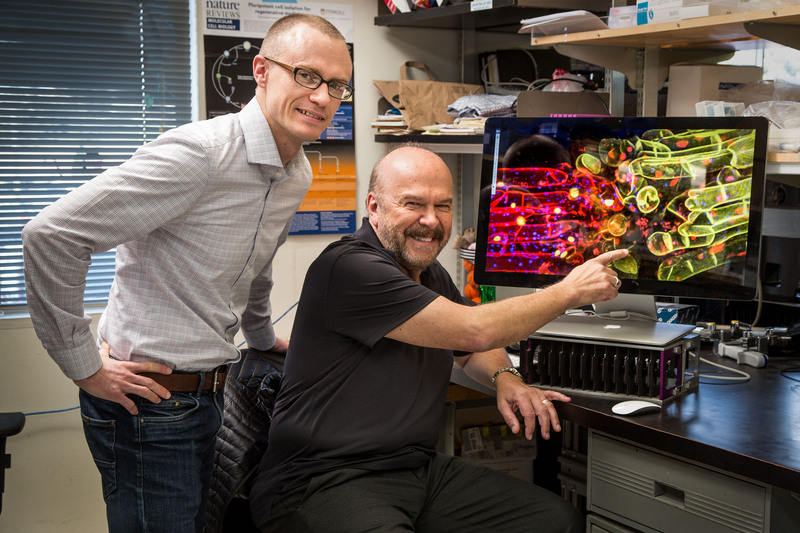 To track the flow of epigenetic information, the Salk and Cambridge teams focused on tiny molecules called small RNAs, or sRNAs. There are various types of epigenetic processes, but sRNAs contribute to a gene silencing process called DNA methylation. In DNA methylation, molecular markers bind along the top of DNA to block the cell’s machinery from reading or expressing the genes under the molecular markers. Previous studies by the Cambridge members of this research group have shown that sRNAs can move across grafted plants from the shoots to the roots. So the researchers designed a grafting experiment with three variations of the plant Arabidopsis thaliana (thale cress). Two varieties were wild-type thale cress, while the third variety was a mutant bred to lack sRNAs of any kind. After performing each graft, the researchers analyzed shoot and root tissue to look for changes in DNA methylation along the plants’ different genomes. They also confirmed whether the sRNAs were moving from the wild-type plants into the mutant variety that lacked sRNAs. “This set-up allowed us to observe something quite unique: they were actually transmitting the epigenetic equivalent of alleles, called epialleles,” says Lewsey. An allele is a gene that is shared within a species, but may differ from individual to individual, such as the allele for developing Huntington’s disease. In this case, the researchers were searching for sites along the epigenome of the plants that were alleles altered by the epigenetic process. In other words: epialleles. “Because the two wild-type plants varied in their epigenetics along their genomes, we could observe how grafting a shoot onto roots can actually transmit epialleles from one plant to another,” says Lewsey. David Baulcombe, a senior author on the paper, acknowledges that the new findings were not totally unexpected. Previous smaller scale work had indicated that sRNAs could move and mediate epigenetic change in the recipient tissue. “What was unexpected, however, was the scale of the changes due to the mobile RNA,” says Baulcombe, of the Department of Plant Sciences at the University of Cambridge. Thousands of sites along the thale cress genome were silenced by sRNAs. By examining the location of these epialleles, the researchers could start to find clues to their purpose. The epialleles observed in the experiment were often silencing areas of the genome called transposable elements, or transposons. Transposons make up part of the so-called dark DNA, or the vast portion of a genome that does not code for genes. Originally called “jumping genes,” transposons can move from up and down the genome to influence the expression of genes nearby. Many of the transposons targeted by the sRNAs in the experiment were very close in location to active genes. Despite this silencing of transposons, there were only small changes in gene expression between the wild-type plants and the mutant plant that lacked sRNAs. Thanks to new gene editing tools, it will be possible to run similar grafting experiments with the more complicated genomes of popular crops. “In other plants with more complex genomes, these effects are going to be magnified by many hundred-fold,” says Ecker, who is also a Howard Hughes Medical Institute and Gordon and Betty Moore Foundation investigator. Baulcombe agrees that the epigenetic effects of the mobile RNA are likely to be much greater with crop plants than in the models species used in the present work. The two research groups are now planning an extended collaboration to explore these effects in tomatoes and other crops. Lewsey and Thomas J. Hardcastle of the University of Cambridge contributed equally to the paper. Other authors of the work were Charles Melnyk and Attila Molnar of the University of Cambridge; and Adrián Valli, Mark A. Urich and Joseph R. Nery of the Salk Institute. Funding for the work was provided by the EU Marie Curie International Outgoing Fellowship, the Gordon and Betty Moore Foundation, the National Science Foundation, the Clare College Junior Research Fellowship, the Gatsby Charitable Foundation, the European Union Collaborative Project Grant ANEAS and a European Research Council Advanced Investigator Grant.